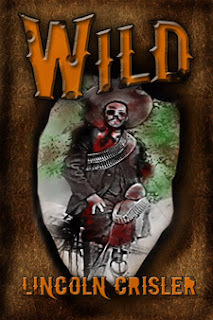 Lincoln Crisler, fellow Damnation Books author, released his debut novella Wild on March 1. Wild is a western tale involving zombies, mysterious lawmen and crooks and the perfect dose of black magic. You can literally smell the dust, gunsmoke and blood within its pages. Crisler’s characters come off the page quite easily and its hard not to get caught up in the terror they are experiencing and the mystery they are trying to solve. Give us your publishing credentials…I’ve been writing speculative fiction for publication since 2006; my work has appeared in such print and online venues as The Horror Library, Down in the Cellar, The Late Late Show and Shroud Publishing’s ABOMINATIONS anthology. I served as a Contributing Writer at Horrorlibrary.Net from 2007 until it shut down and as editor of The Lightning Journal ezine (after founder Mark Deloy stepped down) and the anthology OUR SHADOWS SPEAK. My short fiction has been collected in two books: DESPAIRS & DELIGHTS (2008, Arctic Wolf) and MAGICK & MISERY (2009, Black Bed Sheet). I review books on my website and for Shroud Publishing’s digital, web and print publications. You’re an avid reader and reviewer…what constitutes a great story for you?I like stories that combine themes, that take two or three ideas that could each carry its own weight and blend them together to make something even better. I like a good struggle and a well-thought out (by the author, even if the character does it by the seat of his or her pants!) way of conquering it. I like cross-genre stories and works that take old ideas in new directions. Given your obsession with reading do you find you are influenced or inspired by other writers when you come to create your own work?Not only am I influenced and inspired by the other authors I read, I wouldn’t have it any other way! I wouldn’t want to be exactly like any other author, but some writers are better at making you care about their characters, or at knowing when to crank up the brutality, or at writing conversations. I think a creator always needs to be in school, so-to-speak. The trick is to learn from what you read while still taking the time to enjoy the story! Tell me about WILD! and how did this idea come about?While I was deployed to Qatar last year I got bored and gave my readers and friends on Facebook a choice between whether I should write a zombie-western or something else, and the overwhelming response was for the zombie western. Now that WILD’s been picked up by Damnation Books, I really wish I could remember what that other option was! A graphic novel scheduled tentatively for next summer, a novelette that’ll probably go straight to digital and a collaborative novella with a fellow author. I also have this novel that I’ve been putting off; maybe this’ll be the year for that, too! And finally, where do you see the small press and e-book age. As a contributor to magazines like Shroud, are small presses like DB becoming more accepted?I believe that the small press is a necessity, especially with the publishing game changing so radically, and that forward-thinking small press publishers can be just as viable as the big dogs with a bit of effort. I don’t think that e-books will ever completely kill off print, but technology always has been and always will be a game-changer. The important things are that stories are being told and that the cream will rise to the top. Things aren’t quite as risky as they were ten or even five years ago, and I think that’s better for small presses, authors and especially readers. Lincoln Crisler’s debut novella, WILD, is out now from Damnation Books. He has also authored a pair of short story collections, Magick & Misery (2009, Black Bed Sheet) and Despairs & Delights (2008, Arctic Wolf). A United States Army combat veteran and non-commissioned officer, Lincoln lives in Augusta, Georgia with his wife and two of his three children. You can visit his website at http://www.lincolncrisler.info/.